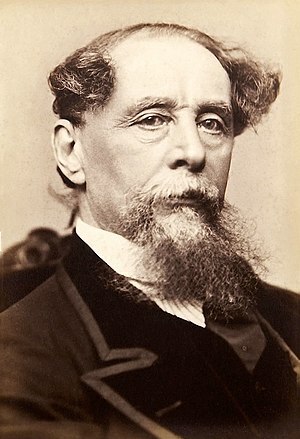 Charles John Huffam Dickens was born on this day in Landport, Portsmouth, Hampshire, England in 1812. Today is 201st anniversary of his birth. He was the second eldest child in a family of eight. His parents were of modest means but dreamed of a bigger, better life. His father, John, was a clerk, Elizabeth wanted to be a teacher — but with 8 children afoot never made it to the head of the classroom. The family was always poor, sometimes destitute. 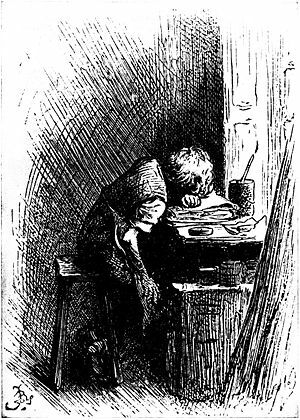 When Dickens was four the family moved to Chatham, Kent. 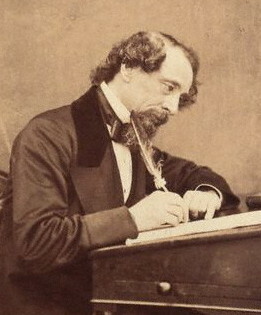 Dickens and his brothers and sisters roamed “he countryside and explore(d) the old castle at Rochester.” [Biography.com] They were happy years, and Dickens attended school and read ferociously. But the good times did not last. John outspent his income and was sent to debtor’s prison at the Marshalsea debtors’ prison in London in 1824. Elizabeth and the younger children moved in with the father, but Frances, the eldest and Charles were sent to live with family friends. John Dickens came into some money when his paternal grandmother died and he was released from the Marshalsea, but Charles’ mother didn’t let him quit the boot-black factory right away. The family had grown accustomed to his six shillings a week. He never forgave her for making him go back to dirt and rats of the factory. Eventually he was able to go back to school, this time to The Wellington House Academy. Unfortunately the experience was anything but pleasant. The headmaster was sadistic, the teaching haphazard and fellow students undisciplined. At 15 he got a job as an office boy at a law office. By 1833 he was being published under a pseudonym, “Boz,” in magazines and three years later his first book, a collection of articles, Sketches by Boz, was published. He wrote often wrote serialization for magazines (sometimes magazines in which he had a financial interest) and then published the finished story in the form of a book. 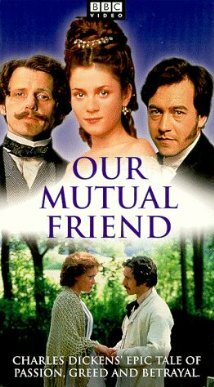 If you are looking for a good Dicken’s dvd to watch during the snow storm we are promised this weekend I can recommend both Little Dorrit with Clair Foy and Matthew MacFayden or Our Mutual Friend with Keely Hawes and Steven Mackintosh. This entry was posted on Thursday, February 7th, 2013 at 11:53 pm	and tagged with Charles Dicken, Christmas Carol, London, Oliver Twist, Pickwick Papers, The Life and Adventures of Nicholas Nickleby (Signet classics) and posted in books, Charles Dickens, England, postaday, Thought of the Day, Today's Birthday, Victorian, Writing. You can follow any responses to this entry through the RSS 2.0 feed.